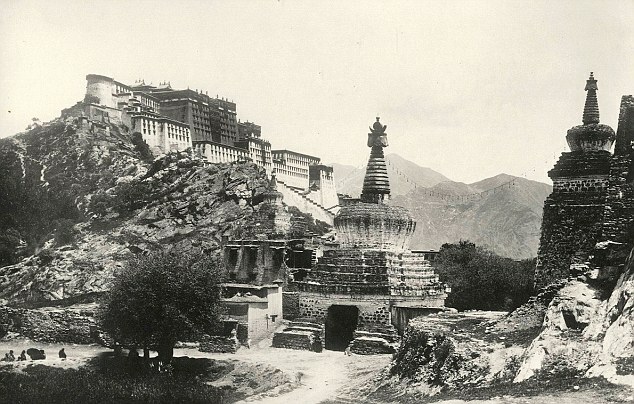 All the early British Visitors to Tibet, from George Bogle to the court of Panchen Rinpoche, Palden Yeshi in Shigatse (1774) to Mr Hugh Richardson, the last Officer in Charge of both the British and the Indian Mission in Lhasa (1936-40) and his second period of residence in Lhasa (1946-50) are well documented. However, the converse is not the case. It is fairly safe to assume that first ever ‘Tibetans’ to come and settle in Britain towards the close of eighteenth century were Bogle’s two daughters from his marriage to a Tibetan lady in Shigatse. They were both later assimilated into the Scottish genteel society where their father came from. As it would have cause some considerable stir among Scottish society of the time, their mother did not visit Britain. Another well-known case is that of Rinchen Lhamo from eastern Tibet. She married Louis Magrath King, former HM Consul at Dartsedo (Tachienlu) Chinese Frontier of Tibet. On his retirement, they both settled in Britain at the turn of this century. She was the first Tibetan, with the help of her husband, to write a book on Tibet in English. Their descendants still live in this country. The case of four Tibetan students who came to Rugby School in April 1913, on British Government scholarships and the visit of the Tibetan Government Trade Mission to London in November 1948, are all well documented. In September 1925, six monks from Shelkar in South West Tibet also visited Britain to participate in the Empire Exhibition. Between late 1927 and early 1928, palhese Sonam Wangyal was in Britain to explore the possibility of Tibet becoming a member of the League of Nations. The above were the first Tibetans to either visit or settle in Britain. All this changed with the invasion and occupation of Tibet by China in 1949/50, which led to the Tibetan National uprising of 1959, culminating in the exile of His Holiness the Dalai Lama and over 80,000 Tibetans into India, Nepal and Bhutan. The second phase of Tibetans in Britain can be traced back to the occupation of Tibet by the Chinese in 1949/50. 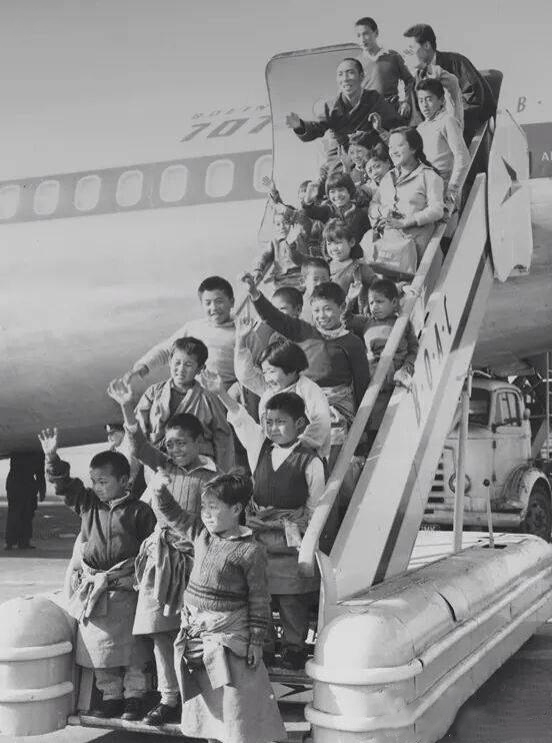 Since then Tibetan visitors were classified as refugees, traveling on documents issued by their first country of asylum. Soon after the tragedy of 1949/50, Tibetans including some Lamas and monks were invited by private sponsors and charity organisations to do an assortment of different courses of studies in Britain. Among these organisations mention must be made of the Pestalozzi International Children’s Village in Sussex which brought over 22 Tibetan children in 1963, followed by another 28 more children for education in England; the Ockenden Venture, which brought a few Tibetans to England for further studies, and the ill-fated Tibetan Farm School in Wales which brought 11 Tibetan students to learn traditional, non-mechanical farming methods. All the students arrived in Britain with the view of serving the exile Tibetan community on their return to India. At the same time as the exodus of the Tibetan people became more widely known, many people all over the world, including the people in Britain, began to show interest in the fate of the Tibetans and their culture, particularly that of Tibetan Buddhism which is the most complete form of Buddhist tradition in the world, encompassing as it does both the sutra and Tantric traditions. The Sixties was the decade when many people in the West, including Britain, were seeking solace in eastern mysticism, particularly in Tibetan Buddhism. By the late Sixties there were about 40 Tibetans in Britain. Although not formally organised as such, they not only maintained regular contact with their families in India and Nepal, but also began to organise parties and meetings among themselves in England. At the same time, a few modest Tibetan Buddhist centres were established under the spiritual guidance of learned Tibetan Lamas and monks. Despite their natural optimism and cheerful disposition, life for Tibetans in Britain was made most difficult because of the uncertainty about their future. Not a single Tibetan in Britain to this day has received any help from the British Government. And what is even more poignant is that the British Government refused and to this day continues to refuse to confer Refugee status on those Tibetans who come to Britain, which would have given them the right to remain in the UK indefinitely. In other words, the British Government appears to have undergone a form of exorcism, whereby it was able to wipe clear some 200 years of bilateral relations with Tibet from its collective memory. It is ironic that the country, with which independent Tibet had the closest of ties, with several bilateral treaty relations, seemed to have suffered from momentary amnesia. Undaunted by such a situation, the Tibetans living in Britain, with their characteristic resilience and, one may add, a touch of foolhardiness, convened a formal meeting in London on 25 September, 1970, to launch the ‘Tibetan Association’. They aimed to further co-operation and communication among themselves, and promote the unique heritage of traditional Tibetan culture. The meeting of 25 September 1970 had significance beyond the immediate confines of the Tibetans living in Britain. It was a meeting of like-minded Tibetans, not compelled by social, political, religious or any other compunction. Seven executive members were elected for a term of one year through secret ballot, without any tinge of regional or sectarian divide. For the first time, the newly formed Tibetan Association was able to establish formal contacts, both with the Tibetan Government in exile in Dharamsala, India, and with a number of Tibetan Non-Governmental Organisations in different parts of the world. The first Annual General Meeting (AGM) of the Association was held at the abbey in Sutton Courtenay, Berkshire, on 11 December 1971. A new five-member Executive Committee was elected at this meeting. The name of the Association was changed to ‘Tibetans in Britain Society’. ‘Thunpa Punzhi’, Four Friendly Brothers, an illustration from a well-known Buddhist parable, was adopted as the Society’s emblem. Furthermore, every member undertook to contribute an annual subscription of £1 to the Society. The creative energy of the newly formed Tibetan in Britain Society was gradually devoted to forging closer ties with the Tibet related organisations in the UK, such as the Tibet Society, the Ockenden Venture, Pestalozzi Children’s Village and the Tibetan Farm School in Wales. The Society was also able to welcome a few newly arrived Tibetans in Britain, and promote closer contact between Tibetans living in the UK and those in Europe. The time was also fast approaching for the first ever visit of His Holiness the 14th Dalai Lama to Europe, including Britain. Members of the Society led by Committee worked wholeheartedly preparing for the visit. They contacted numerous friendly organisations and individuals interested in the event, and made a huge effort in preparing the Abbey in Sutton Courtenay to receive His Holiness. On the morning of 27 October 1973, all the members of the Society and their friends in traditional costumes with ceremonial white scarves, lined up on either side of the short driveway to the Abbey to receive His Holiness. In the afternoon, to the delight of everyone present, His Holiness gave an informal talk, audiences and blessings to all the Tibetans living in Britain, and those who came from other parts of Europe. 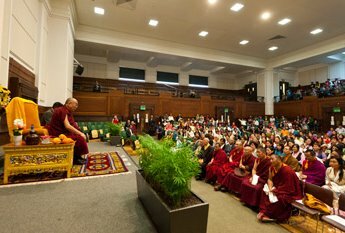 This was a unique opportunity for most of the Tibetans in Britain to come face to face with their spiritual and temporal leader. The visit did much to remind Tibetans of the plight oof their fellow countrymen in Tibet, and their own position as stateless refugees. At the same time, it renewed hope and a sense of responsibility as representatives of the Tibetan people as a whole. It enhanced their determination and enabled them to rediscover their identity as a proud people with one of the richest cultural heritage in the world. The occasion brought together all Tibetans once again to work for the common purpose of making the visit a success. The following year saw two important symbolic developments – extensive discussions among the members for the need of a Council to decide on future policy of the Society and to guide the day to day workings of the Committee; and to send voluntary contributions to the Assembly of the Tibetan People’s Deputies toward the expenses of the Tibetan Administration in India in line with all the Tibetans living in the Indian subcontinent. Although it was to take a further two years to form the Council, the Society was able to send, for the first time, a modest contribution towards the expenses of the Tibetan Administration in India, thus making the Society one of the first Tibetan organisations outside the Indian subcontinent to do so. Its first annual contribution amounted to £10! 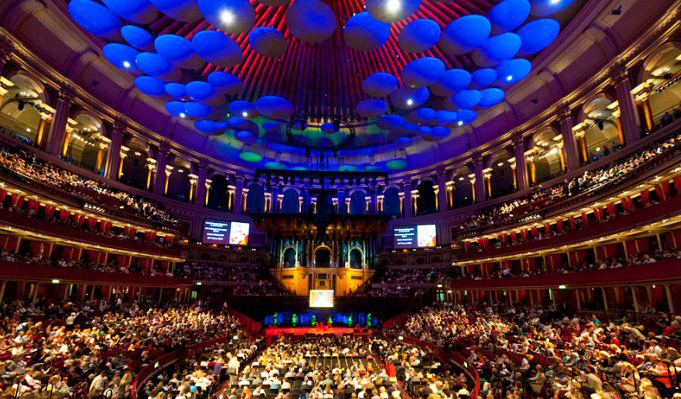 His Holiness the Dalai Lama’s public talk: ‘Real Change Happens in the Heart’ at The Royal Albert Hall in London on June 19, 2012. 1976 was a watershed year for the Society. The sixth AGM was held on 7 and 8 August 1976, at Quartermaine House in Surrey. All the 38 members who attended the AGM took an active part in the two days of discussions. It was agreed that the name ‘Tibetans in Britain Society’ should be changed to the ‘Tibetan Community in Britain’. It was decided that all members should make a basic voluntary contribution of £3 a year towards the Tibetan cause ( Gyalche Mangul). In addition, the Executive Committee was instructed to draft a constitution for the community with basic rules and regulations to be ratified by a majority vote of a General Assembly of the Community. The Committee was further instructed to keep in close touch with the Office of Tibet in Switzerland and the Private Office of His Holiness the Dalai Lama in India, and the Committee should hold regular monthly meetings to discuss the day to day workings of the Community. In turn, the members were requested to maintain contact with the Executive Committee for news of Tibetans inside and outside Tibet and to inform the Committee of any work done in the name of the Tibetan Community by individual members in order to honour the position of the Tibetan Community in Britain.